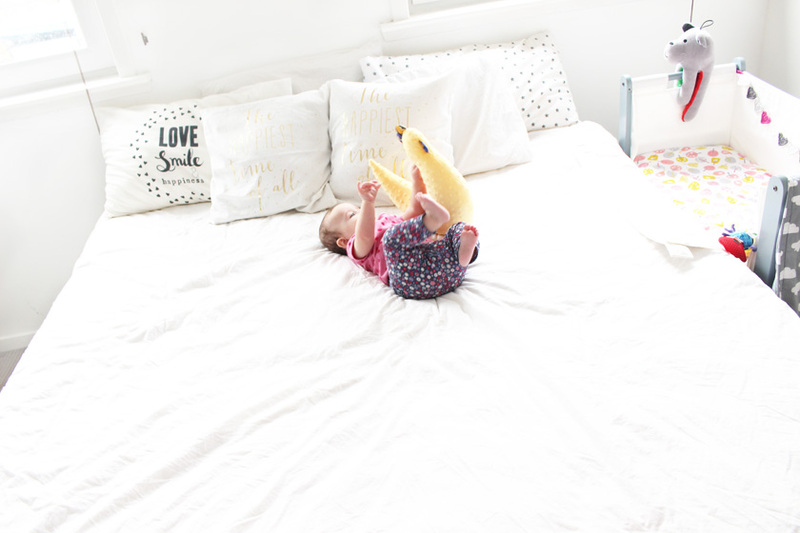 We recently moved things around in the bedroom to accommodate our new super king size mattress, so I thought I will take some photos and do a little update, before we totally redecorate and switch Mia's co-sleeper to a full size cot. 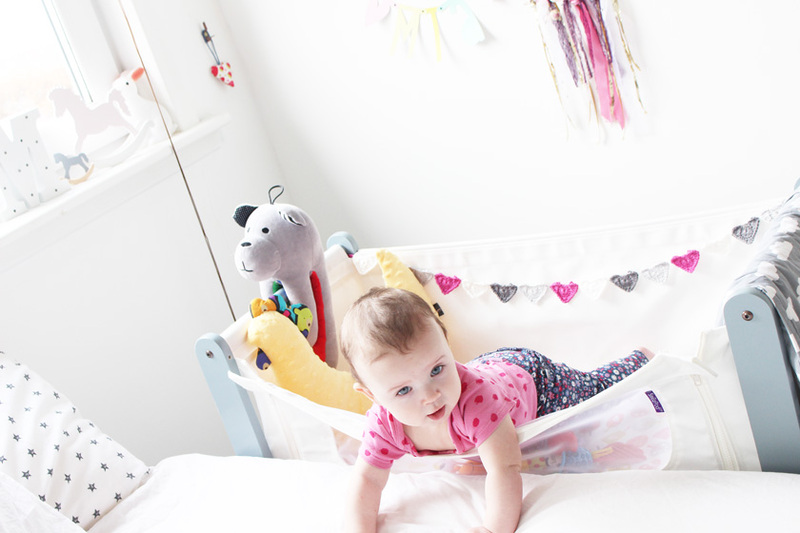 You can see the previous layout here, which I loved, but it wasn't working with the huge new bed and co-sleeper, so we moved the bed under the windows and got rid of the headboard temporarily. The actual bed base is a DIY job with the old double divan base in the middle with added ikea units around it to support the mattress, as they are the exact same height as the base. 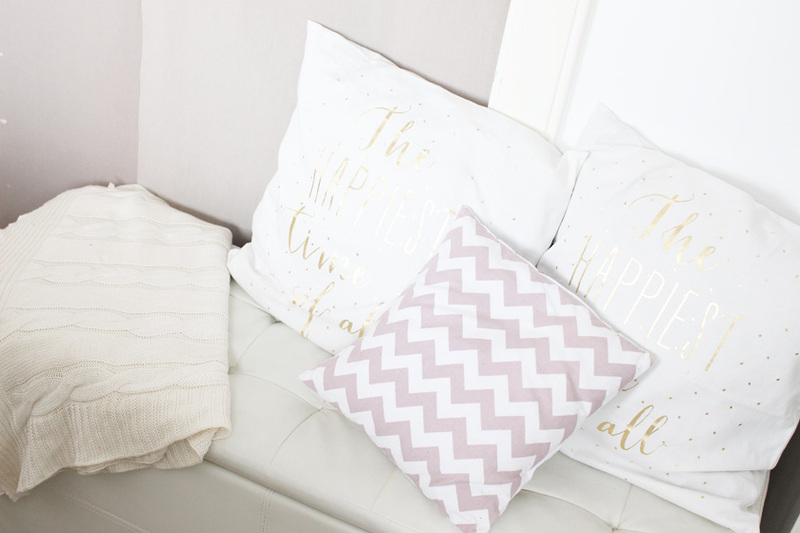 To make up for the missing headboard, I added more pillows, all from H&M. I love them all! The Snuzpod is on my side obviously, but as you can see, this cheeky monkey figured out how to get out of it and she's getting to big for it, so it's days are numbered. I will miss it soooo much! 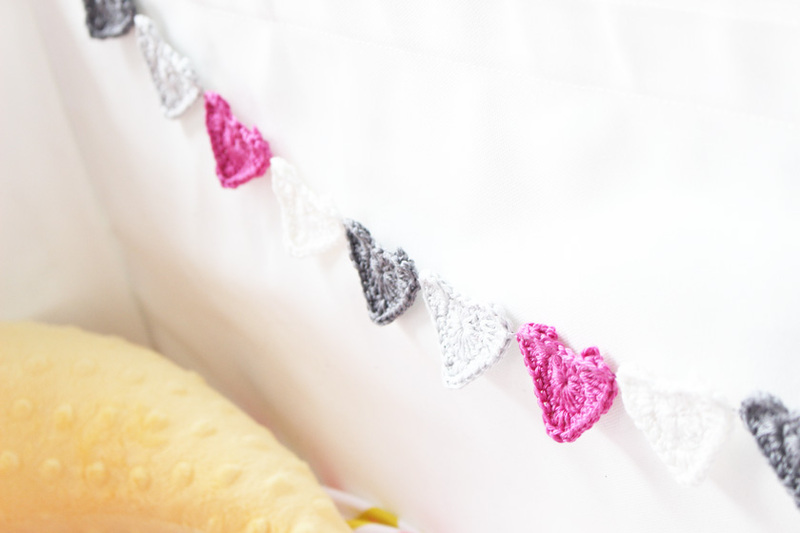 I added a little diy crochet heart garland to add a personal touch to the Snuzpod*, but I just move it to the other side when Mia is in it, as she just grabs it and I am worried she might wrap it round her neck. I know... 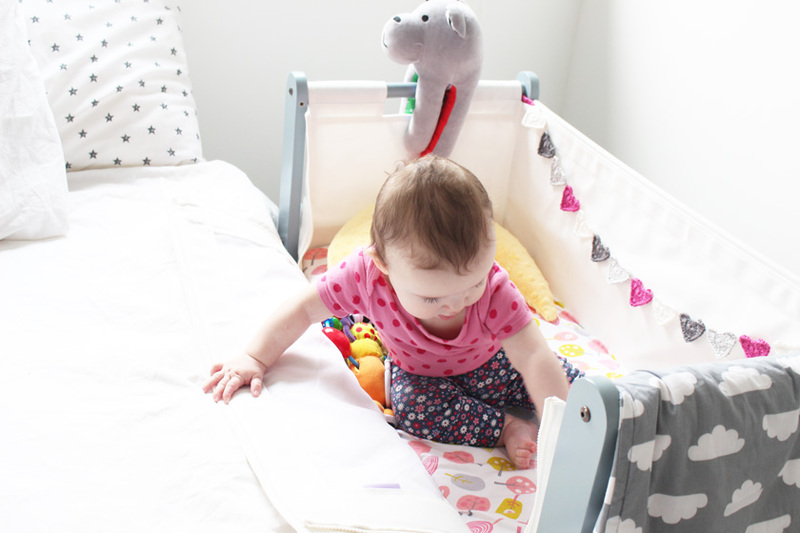 I am paranoid :) We also have the new Snuz bedsheet to add a bit of colour, our Whisbear*(review coming soon), Click Clack Zack (Mia's favourite Lamaze toy) and the gorgeous La Millou Mini Hen*. 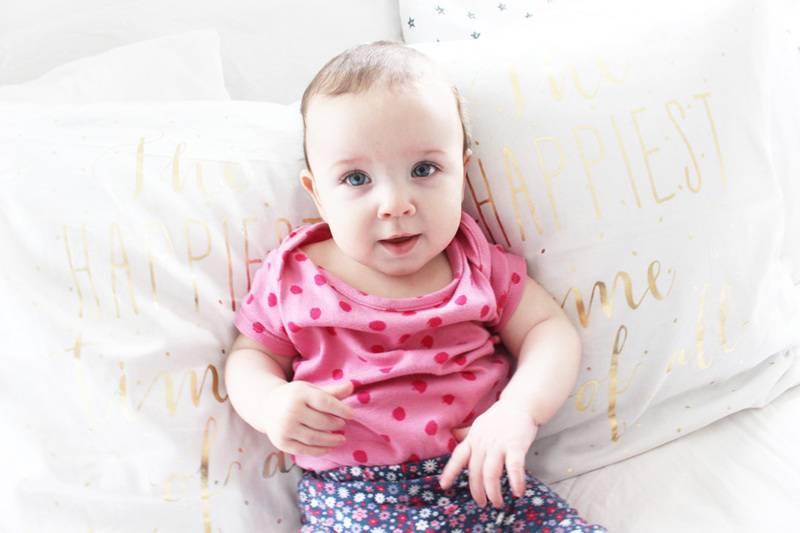 She's sitting up now, so I have to be with her at all times, if I want her to play in the Snuzpod. She actually sleeps with me most of the night now, so the Snuzpod is just there to prevent her from falling off the bed. A little poser :) haha. She is so wild. Right after taking this photo, I had to throw myself onto the bed and grab her, as she was trying to dive off the bed :) Crazy little lady! And a bit of morning yoga. In this corner, we have two of our old bedside tables and a washing basket. 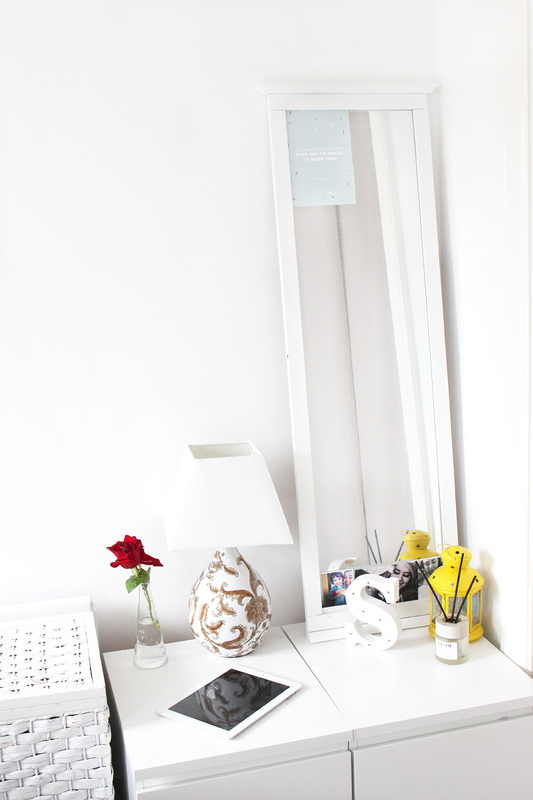 I put the mirror on top of the unit, as I didn't want to put more holes in the wall and it is at the perfect level to check out my outfits :) The letter S is from Home Bargains, the lantern from Ikea and diffuser from Neom. 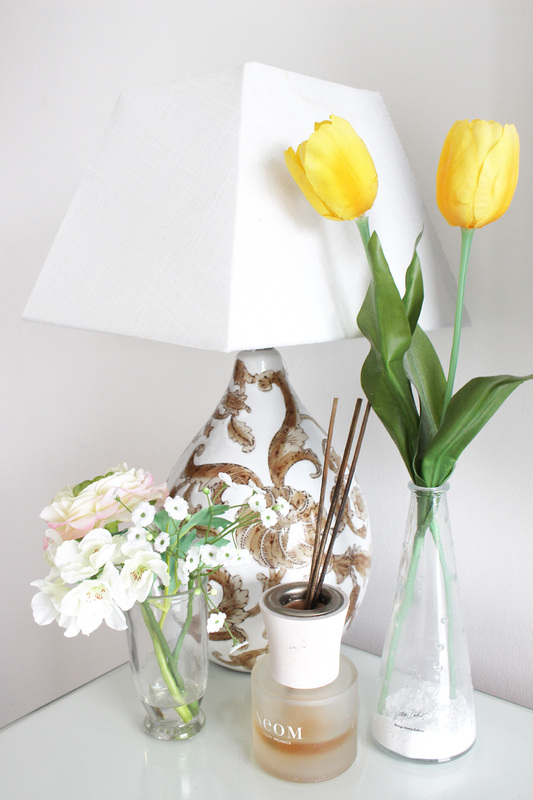 The lamp is a TK Maxx find, but we changed the shade on it. 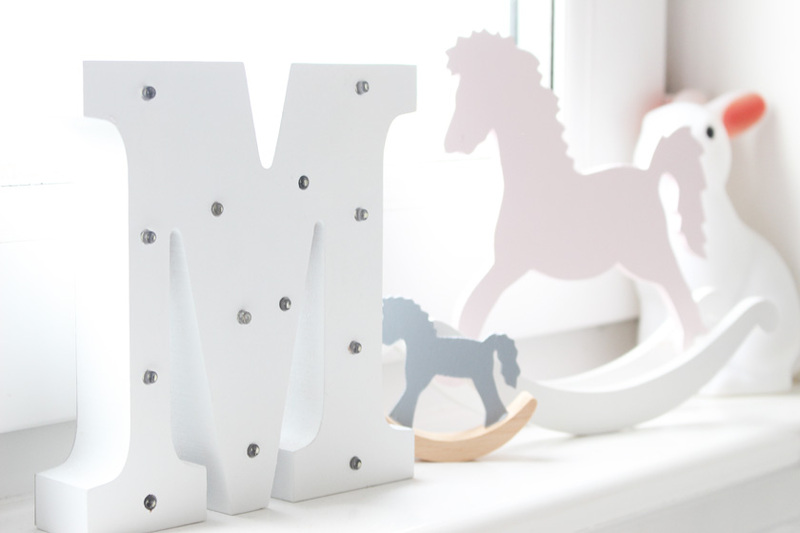 I wanted to add some baby bits and bobs to Mia's corner to make it more cosy, so I put the marquee M light, wooden rocking horses and a little bunny lamp on the window sill. 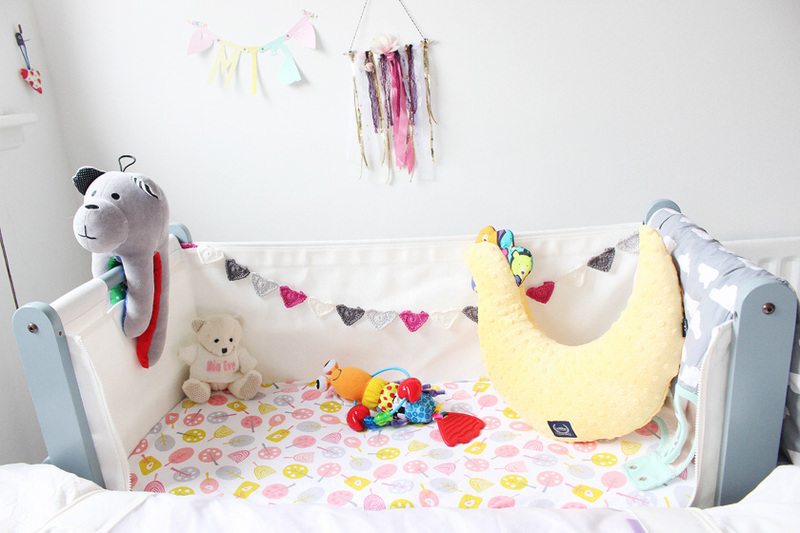 The rocking horses are from a Polish brand Turkusowa Pracownia. So lovely! 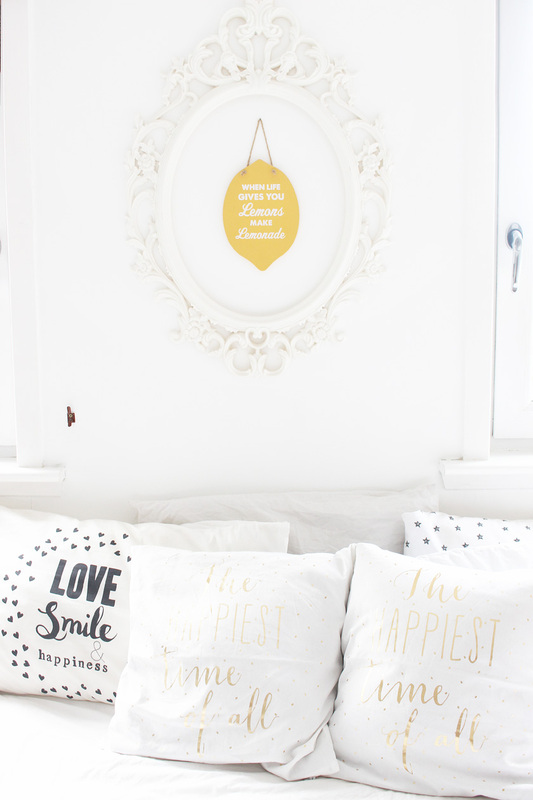 I actually love the way the pillows and cushions look without the headboard and with the big frame and lemon plaque above the bed. 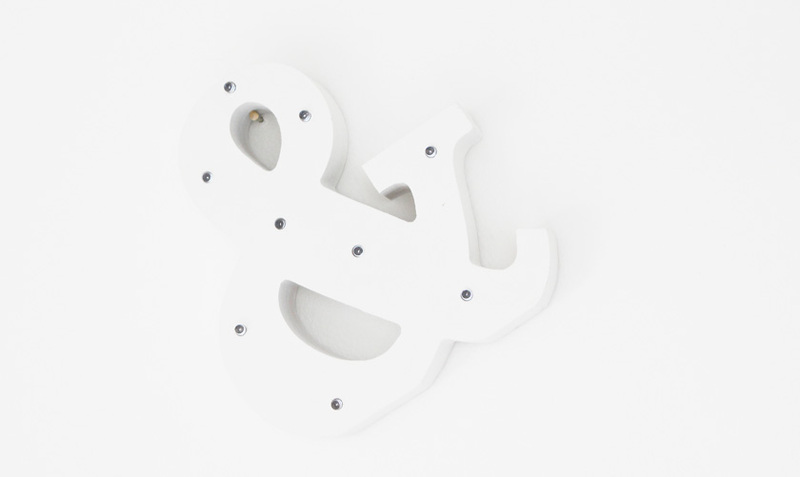 The '& marquee light' is on the wall opposite of the bed. God... It is one bright light! The faux leather blanket box we used to have at the bottom of the bed is now sitting next to the wardrobe and blocking it slightly, but it's fine. I am not sure what to do with it, but I kind of like it there. 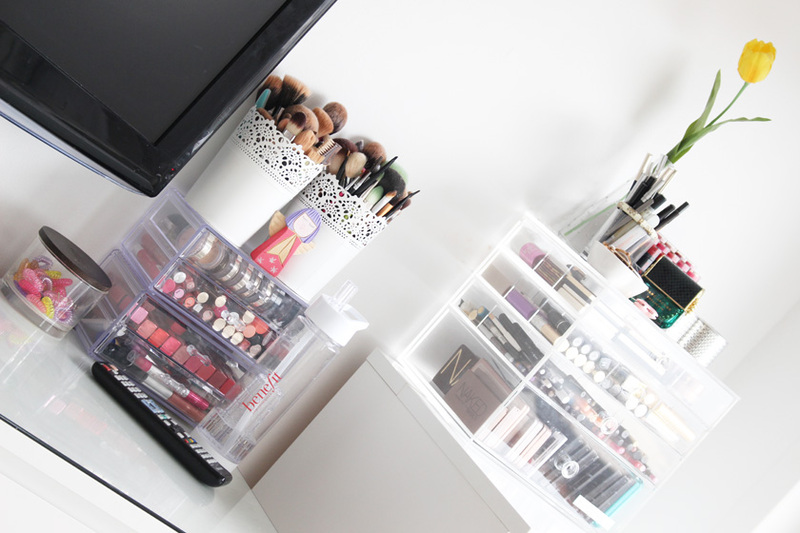 Nothing really changed on this wall, except extra makeup storage on the right and one of the bedside lamps sitting on the left. 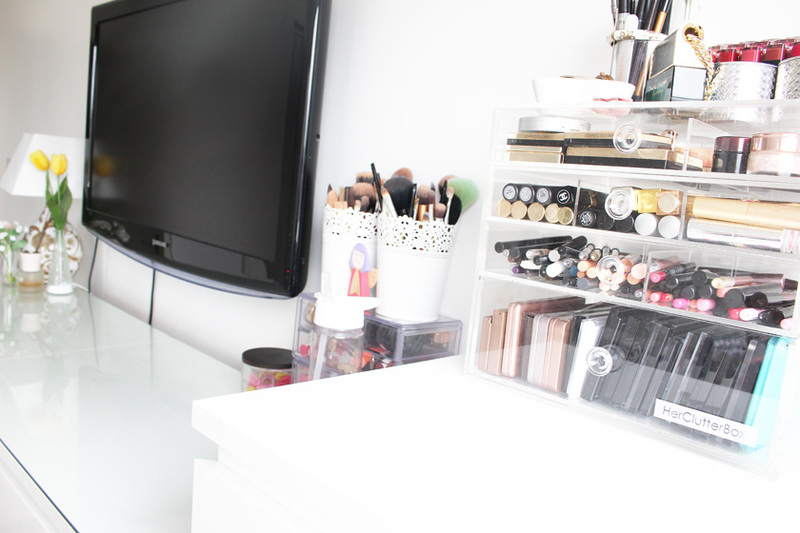 My husband hates my acrylic makeup storage sooo much... but I love it! 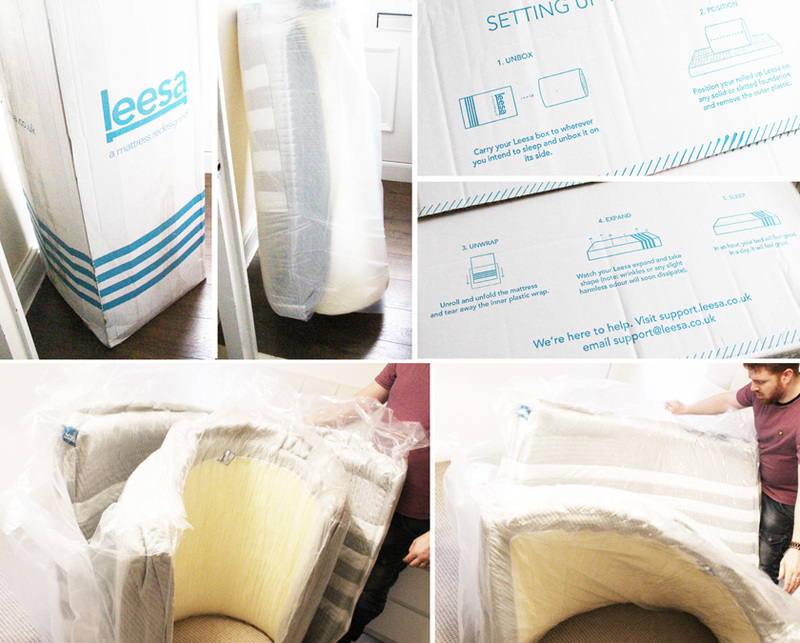 And here is the actual reason of the layout change - our new Leesa mattress*. I've been meaning to upgrade our bed from a double to a king size or super king size for ages, but there was never the right time. We finally opted for the Super King Size, as Mia and Zac end up in our bed quite often and a double was killing us! My back was soooo sore and I was being pushed off the bed every single night. Not anymore!!! YAAAAY! 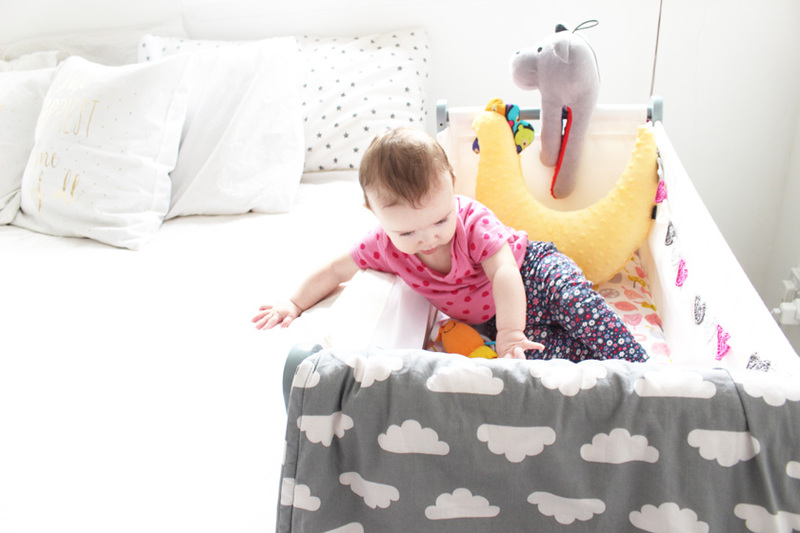 The Leesa mattress is a godsend! 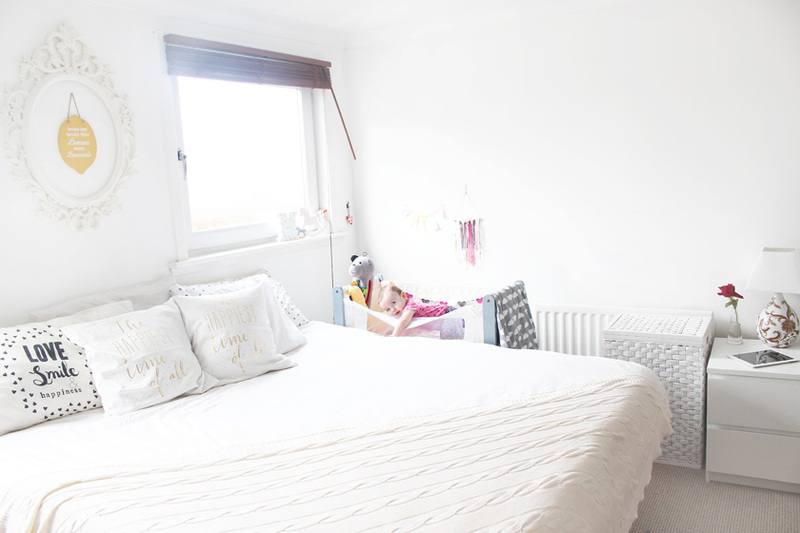 The super king size is absolutely huge and gives us so much space! I can finally sleep like a normal person, even when both Zac and Mia decide to join us at night. 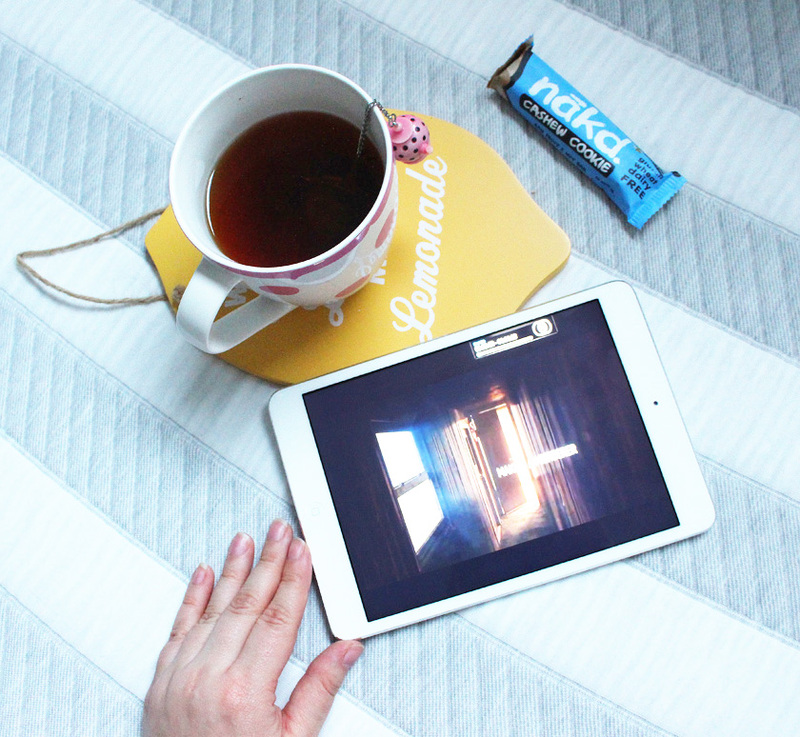 Let me tell you more about the Leesa mattress. First of all - it is the comfiest mattress I have ever slept on. Oh my... it's like sleeping on a cloud! Not too soft and not too firm. It is meant to be universal in terms of firmness. 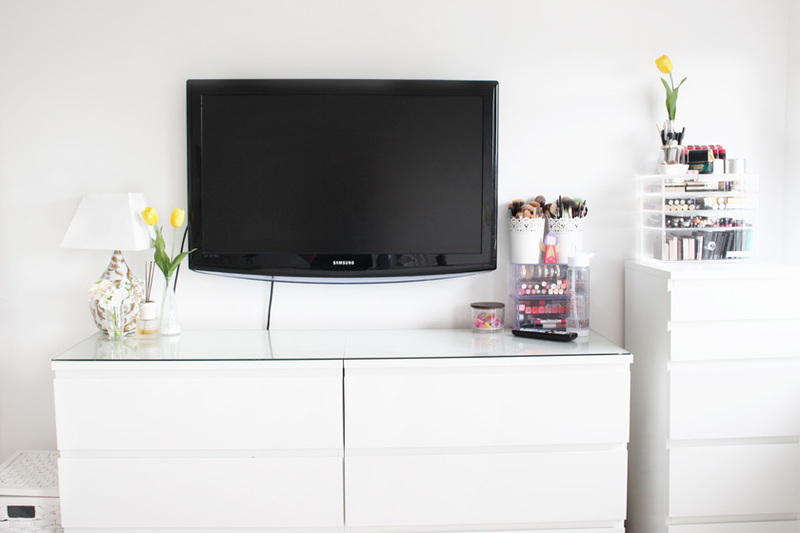 It feels very luxurious and the price is actually pretty affordable, considering the quality of the product. - top layer - 5cm of Avena foam (latex foam alternative). 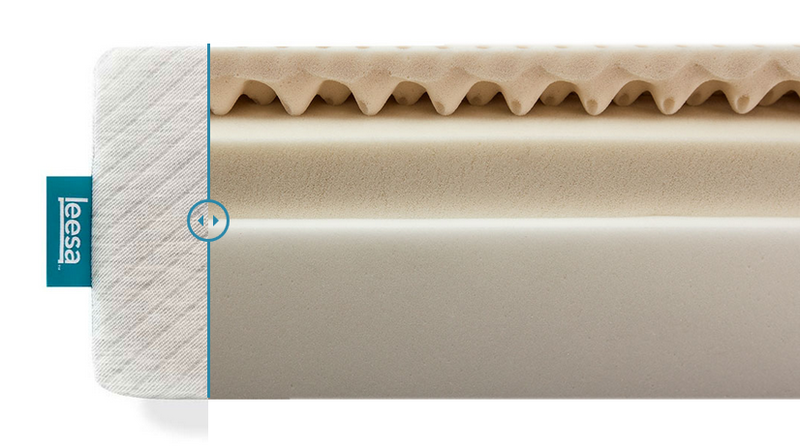 -middle layer - 5cm of memory foam. -base layer - 12 cm of support foam. 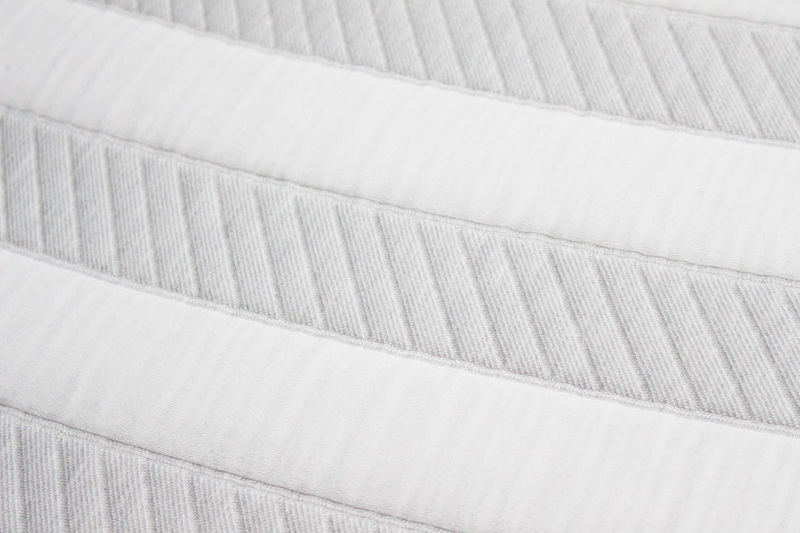 All the layers combined offer cooling bounce, contouring pressure relief and core support for amazing sleep, night after night. 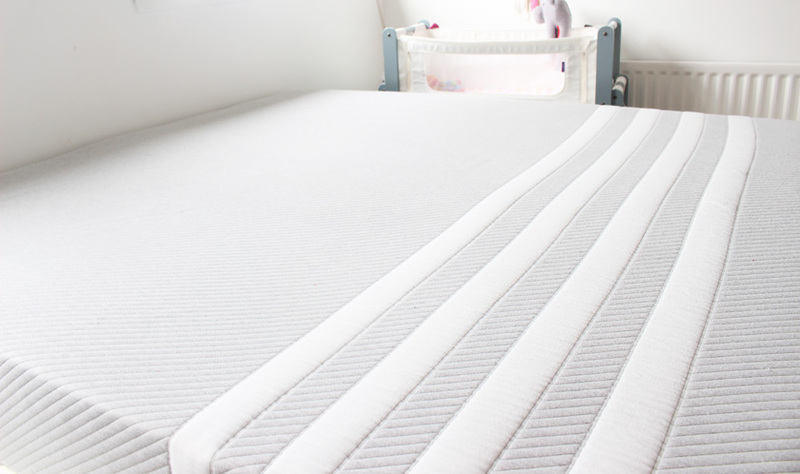 Leesa is also hypoallergenic, which is a very important factor, as my husband is severely allergic to dust and our old mattress was really irritating him. The cover is my favourite feature, as it is absolutely stunning! 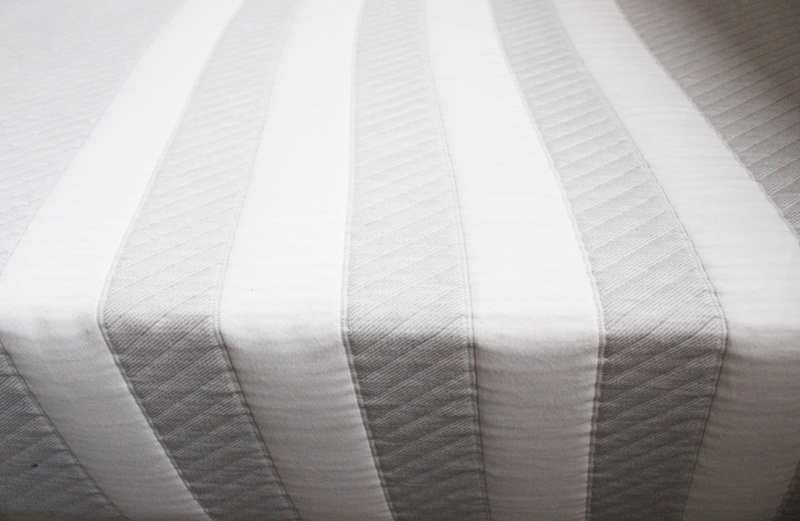 Woven from a single piece of polyester-lycra blend fabric, the 4-stripe Leesa cover feels cool and soft to the touch and has no annoying seams or buttons - something I hate about normal mattresses! . 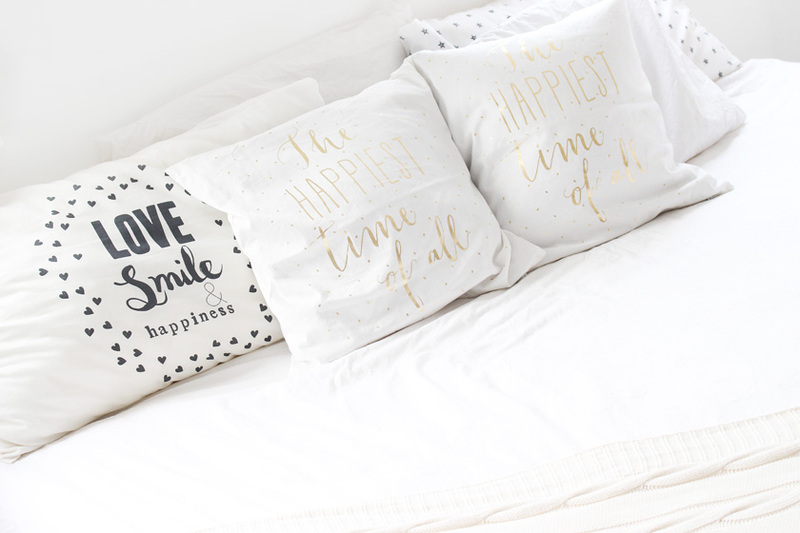 What's great about Leesa is the fact that they offer a 100-night risk free trial to all customers to make sure you are 100% happy with the mattress. With free delivery and returns, it is completely hassle free! As you can see on one of the photos above, the mattress arrives compressed in a box and once you take it out, it expands and takes it's final shape. Amazing! I have seen people use the Leesa without a bedsheet, so we have used it without a bedsheet for the first few nights, but... I would recommend using a bedsheet from day 1, as I we both caught the fabric with our nails and rough skin etc and you don't want to be ruining it, as it is just too luxurious. 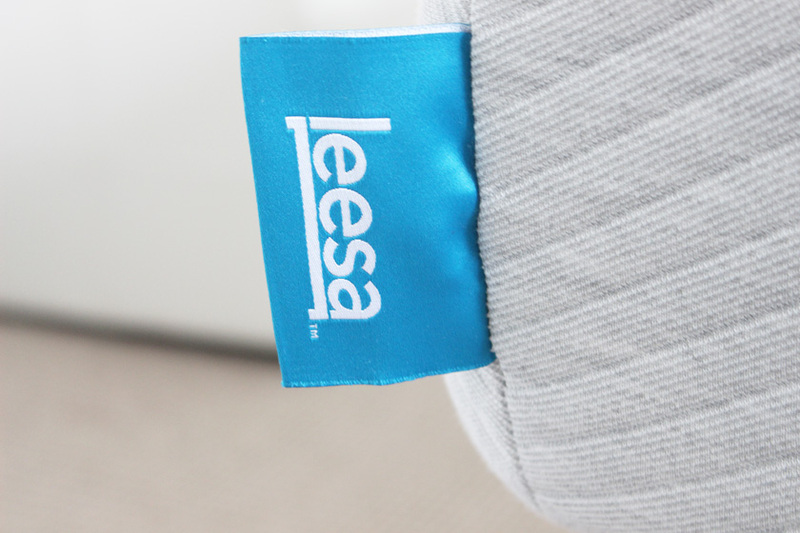 I wish I could get a spare cover for the Leesa for emergencies - it would be incredible. I hope you enjoyed this post. If you want to treat yourself to a new amazing mattress that will change your life (it definitely changed mine! ), Leesa is now on offer and you get £80 off your purchase! 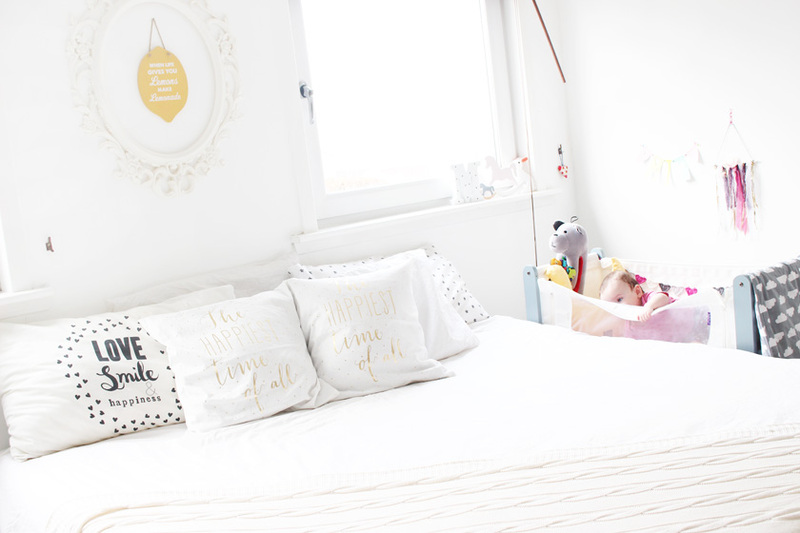 They also donate 1 mattress for every 10 sold to charity and plant a tree for every mattress sold, which is just fab!